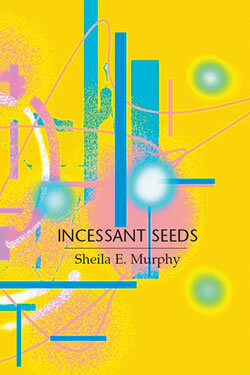 Written in a luxurious squared sonnet form as requested, this book of poems by Sheila E. Murphy gives insight into her versatility within a boundary while not obscuring her intent and content for form's sake. A wonderful book, I do hope you have a chance to appreciate a copy. Incessant Seeds can be viewed as both the yield and record of a process that involves working in units comprised of 14-syllable lines and 14 lines. Such a rule-based flow has the capacity of allowing a wide range of subject areas, perspectives, concerns, and swatches of language equivalent to musical phrases. I followed a similar approach when writing an earlier volume Teth, published by Chax Press, slightly more than a decade before composing Incessant Seeds in 2001. I found that rule-based composition leads the mind to find and gather like-sounding, like-shaped arrangements of words or syllables. It became clear that the more I used the determined method, the more in sync I became with the vibratory pattern inherent in the rule itself, an ironically liberating practice. During a series of online conversations, David Baratier mentioned the prospect of my working in 14-syllable lines. I used the 14-line unit, thereby discovering Incessant Seeds. While this approach is not my exclusive way of creating, I especially value its heuristic properties.